This patient presented with old amalgam restorations that showed deterioration at the margins with recurrent decay. The teeth were restored with direct (chairside) resin restorations with materials that mimic natural dentition. Care was used in restoring teeth to their natural morphology and colors with added individual characterizations. 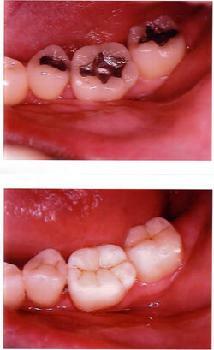 Extensive decay present under old amalgam restorations. 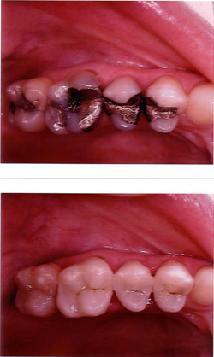 As amalgam restorations age, they expand and allow decay to set under the amalgam and fracture the teeth. The teeth were restored with bonded indirect resin onlays that will restore them to their original form before they had any decay. 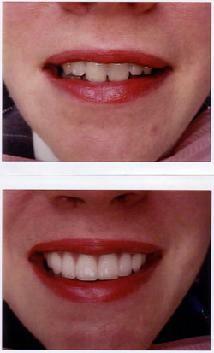 This patient was not happy with her smile which showed a disproportionate length of anterior teeth with discoloration. All-Porcelain Crowns were placed to straighten, lengthen, and brighten the teeth. Note that light reflection is even on either side of the midline. 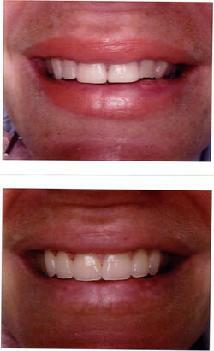 This patient presented with old Veneers that show little vitality and translucency. The two front teeth are not proportionate to the rest of the anterior teeth. 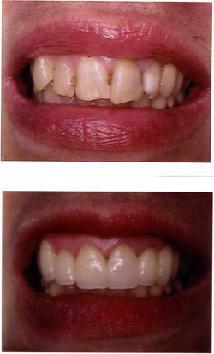 Porcelain Veneers were placed to improve the overall proportion of the anterior teeth. Note that light reflection is even on either side of the midline. The multi-chromatic approach allows for translucency at the edges of the veneers that mimic the natural dentition. This patient presented with extensive decay and breakdown. Upon clinical evaluation, it was noted that most of the teeth could be saved with extensive treatment and a firm commitment from the patient. 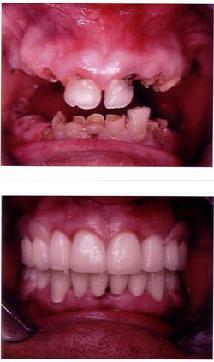 The teeth were restored with All-Porcelain Crowns, soft tissue recontouring and posterior removable partial dentures. This allowed for re-establishment of proper lip and facial support.